Rain coat is done – phew! It’s not often these days that I spend a month working on the same sewing project. But this rain coat has been a handful, that’s for sure. Apart from the sleeve incident, I’ve melted fabric, created permanent holes in the wrong places and watched eyelets come loose after the assembly. But somehow I’ve managed to solve most of the mishaps and learned to overlook the remaining ones. I finished the rain coat 11 pm last night and luckily it was pouring this morning, so I have already been test driving the coat – and it’s waterproof! And I love it. Love it! I won’t exhaust myself (or you) with all the details of the making today, but I will talk about how to sew waterproof garments in a separate post. This is quite unique and modern. I like it. Well worth the time you spent on it. Fantastic! I can see why you love it so much. There's nothing like having the weather cooperate so you can test-drive a new garment! The raincoat looks great and you look adorable. It looks super. And functional to boot – best of all possible worlds. What fun! Makes me want to go and jump in puddles. Absolutely perfect. I love your jacket. You did an awesome job! Your pictures are so perfect too. Your perseverence paid off–just look what you have! That's a great coat. Enjoy wearing it and receiving all kinds of compliments! 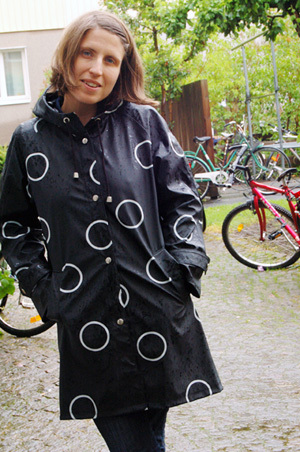 Great raincoat – I love your fabric choice! Definitely looks like it works! I get so frustrated with long projects—you had good patience! Looking good. That coat is wonderful, totally worth all your time and efforts and swearing. I love the raincoat. Obviously finished in the nick of time! Amazing, great coat. I can tell you love it from your big smile! Also, I love your new slideshow "Made by me" – so many great pieces. Snyggelisnyggt! Skulle matcha mina prickiga gummistövlar perfekt. Vi får ta en regnpromenad nån gång helt enkelt. 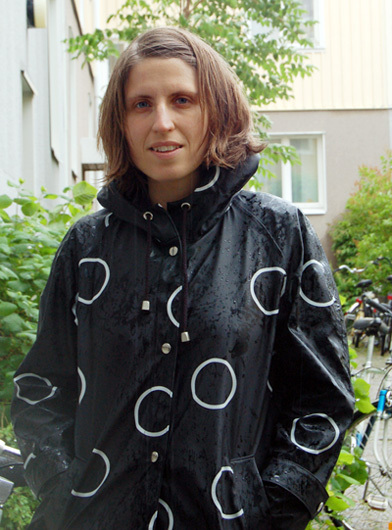 I want to try to sew a raincoat too! Yours is fantastic. Nice pictures. Den är jättefin! Jag är själv sugen på att sy min egen regnjacka, men jag undrar bara om man ska fodra den? Did you ever post your details on waterproofing? I am trying to make a raincoat for my daughter and would love to read your tips.